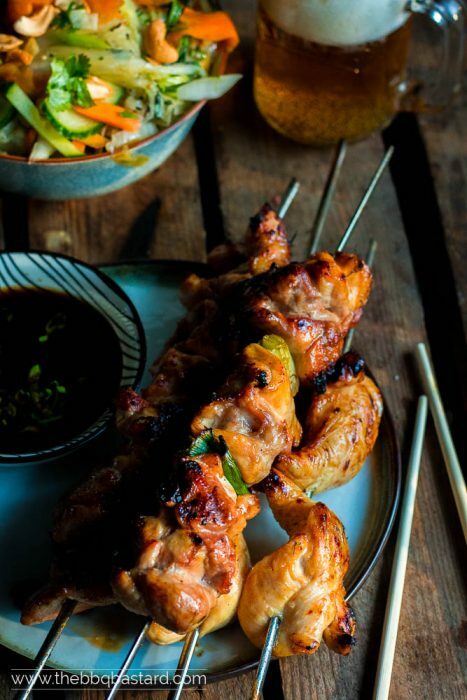 Jonas Cramby sets the world on fire with his new book “Yakitori & Korean BBQ”. Yet this book is still on my wishlist (hint). Not only because of their close attention for balanced flavours in their meals. Besides that I truly admire the meditational approach on cooking. Probably because this is by far not how I cook. You should just ask my wife (or maybe you better don’t do that). Anyway what I lack in organisation is compensated by passion and love for experimenting in the kitchen. That’s why I couldn’t wait for the background information to start cooking. 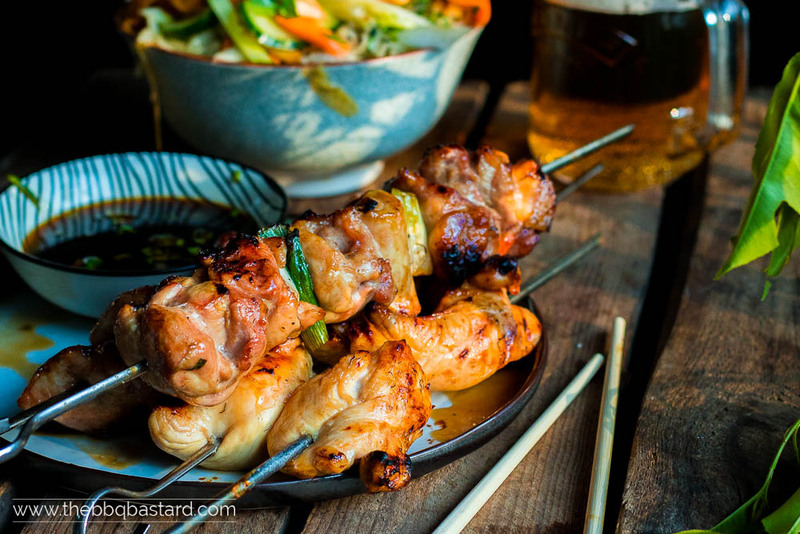 With this recipe I’ll bring you my personal version of the Yakitori style chicken skewers. Hope you like them as much as I did! As stated before I love the mindful approach on cooking in the Japanese kitchen. By paying close attention to the way they prepare their meals, balance it’s flavour profile and paying close attention to the looks of it they fully engage in what they do. Mindfulness in it’s purest form. But there’s more. While I struggle to balance my attention between the kids and cooking, they cook all together. By doing this the passion for food is passed on from parents to their kids. Unlike my kids who learn my chaotic approach, they are born with the zen approach on cooking. Maybe I should learn from this and try to involve them more in my cooking sessions. Probably not all Japanese families manage to handle this approach, yet it’s something I think all of us could learn from. And if I can believe the book reviews, a big part of the book “Yakitori and Korean BBQ” by Jonas Cramby, focuses on this approach sharing techniques and meditational hint besides the recipes. A must have if you ask me. 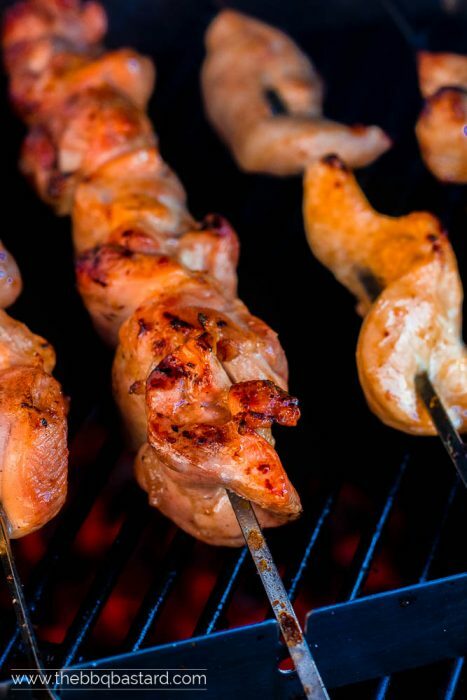 The term Yakitori refers to the japanese art of grilling pieces of chicken on Binchotan charcoal. The exclusive charcoal is steamed at blazing hot temperatures making it harder than any other charcoal. It burns on a lower heat and longer than regular charcoal. This makes it easier to grill the pieces of chicken equally. Unfortunately in Belgium the Binchotan charcoal costs more than the money in my wallet. Depending on the pieces of chicken used, different names are given to the chicken skewers. I’ve made four versions. First I made “Sasami” (chicken breast), second I made my personal favorite “Negima” (chicken thigh skewers). I made both of these versions cured with salt and another skewer with a tare-sauce. Tare is a sort of dipping sauce often used as a glaze (teriyaki). The beauty of these Tare-sauces is the balance in flavours. With sweet honey, salty soy sauce and the acidity of vinegar as key ingredients. Over here people refer to teriyaki as a typical sauce sold in the supermarkets. Recently I learned that us Western people were wrong. Instead of a sauce the name Teriyaki refers to a cooking technique were meat is cooked or boiled in a tare-sauce. By doing this the tare (dipping sauce) forms a glaze on top of the meat. So actually without knowing it a lot of BBQ lovers use the Teriyaki technique quite often. Yet the flavor profile in asian kitchen is totally different. I’ve been longing to do this session but my skewers were terrible. So when I saw this set in the local lidl store I immediately decided to buy it and make these yakitori style chicken skewers. I’ve searched for ingredients available at most supermarkets to make a sauce based on the traditional tare sauce and was quite happy with the result. 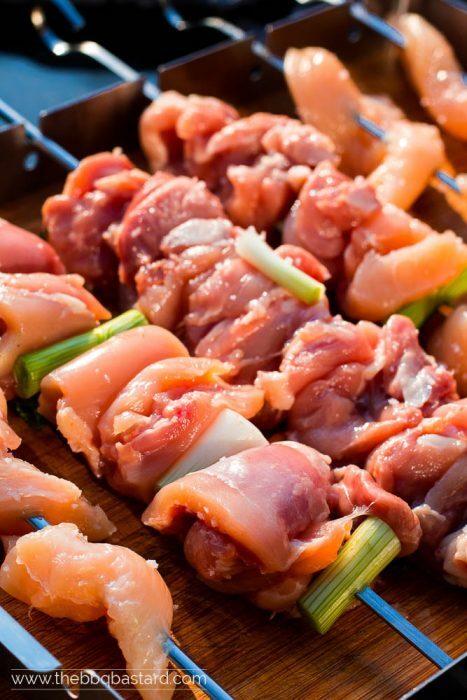 Chicken skewers are very popular in the European BBQ culture. Yet in my opinion the true art of bringing skewers to a higher level can be found in Japanese kitchen. With love, care, attention and precision they bring you the best meditational skewers. The art of making these skewers is what they call Yakitori and forms the base of this recipe! Have fun! Prepare your BBQ for grilling on medium heat coals. While the coals are heating up, mix all ingredients for the tare sauce. Cut the chicken thighs in equal cubes from about 1 à 2 cm. Season them with salt and put on the skewers. Grill the skewers and turn them every once a while. As soon as the thighs begin to brown you can bast them with the tare sauce. Keep on grilling until they are ready to serve. Watch out the sugars in the tare sauce don't burn. So keep on turning. About 15 minutes later the chicken skewers are done (depending on the size of the cubes and the heat of the coals). Serve with a fresh salad or a cold beer. The Japanese salad I'm about to share next week is perfect. Watch out for it ;). - This post is sponsored by Lidl. I get my ingredients refunded by the store. All products are handpicked and chosen by me. - There are affiliate links on "Jonas Cramby"